Has been closed and boarded up for quite some time. Expect conversion to non-pub use. Curious sort of place, probably suffering a bit from the only other pub in the area following the Radnor Arms closure - the Warwick Arms - being almost next door. More down to earth than its near neighbour, it offers three real ales from the Youngs/Charles Wells stable, with excellent Bombardier at a reasonable (for the area) �3.00 per pint. Good, if loud, jukebox. Small patio beer garden out back. Pub was quite empty but I loved it. The place looks great, the staff are friendly and the Thai food was really good too. 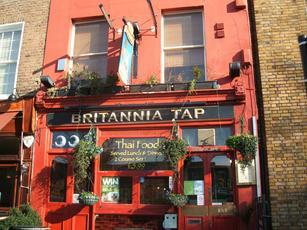 I quite liked this pub although I�ve only been once and it was almost empty. The beers are Youngs and they also have a bottled range, I had a nice bottle of Double Chocolate Stout. It�s only a small pub but does have a real fire and a heated outdoor patio area that is part covered. I wonder whether it struggles a bit because it doesn�t really look like a pub, its next to a restaurant and with its adverts for Thai food and the shuttered windows it looks a bit like a restaurant itself. OK place for a beer though.